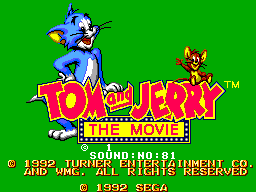 Tom and Jerry: The Movie - Cheats - SMS Power! 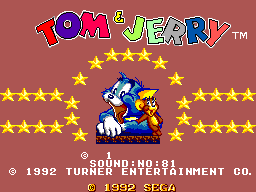 During the title screen, press , , , , , , , on controller 2. Note: You have to press the diagonals precisely, so this is almost impossible to achieve. Press on controller 2 to enable test mode, where you have infinite continues, and you can press on controller 2 in-game to pass the stage and to fail. Press on controller 2 to enable infinite health. Use on controller 2 to select the stage/sound test. Press on controller 1 to start the game.